ADAM SANDLER THE HYPNOTIST LYRICS"
Dr. Stewart: Hi, [I'm] Dr. Stewart. Gary Phelps: Hi, Dr. Stewart. Nice to meet you -- I'm Gary Phelps. Dr. Stewart: My pleasure. Gary, have you ever been hypnotized before? Dr. Stewart: All right, and you were referred to me by anyone...? Dr. Stewart: So smoking is your problem? that stuff like that, so I, I gotta give it up. Dr. Stewart: How long have you smoked, Gary? just want you to again relax and try to concentrate on nothing. Okay? Gary Phelps: Are you gonna keep doing that, or...? Gary Phelps: Oh my god...that was, uh....are you gonna keep doing that? that. I can't concentrate when you're doing that. Gary Phelps: That'd be good. Gary Phelps: Jesus...Oh my God. to two, and all we're thinking about is healthy, fresh air. Freshness. okay, okay, fine, thank you. Dr. Stewart: No, no, that time that was you. Gary Phelps: That wasn't me! Gary Phelps: OK, I've just gotta kick this habit. Gary Phelps: I can't breathe, sir, uh, I'm sorry, I just -- ["squirty"
Gary Phelps: Yeah, I'm under, I guess. Gary Phelps: That was not me, sir! I'm watching you! have no bad gas; it was all from outside or from -- from -- you yourself. And let's not forget the smoking thing that's why you're here. No smoking. Repeat after me: I am a smelly pig. ripped a good one there. That was a nice out..
Gary Phelps: That was not nice. Gary Phelps: What was that? Dr. Stewart: That was three. Gary Phelps: It didn't sound like three. and -- [snap] Do you want a cigarette? Gary Phelps: No I don't. Dr. Stewart: Then my job is done. Gary Phelps: OK, thank you, Doctor. 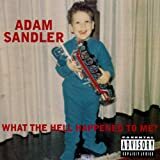 All Adam Sandler - The Hypnotist lyrics are property and © copyright of their respective owners. All The Hypnotist lyrics provided for educational purposes only.